Today: Tom starts to get headaches whenever he reads. So he searches for an eye doctor using, say, Yelp or Vitals. Weeks later: He needs hiking shoes for his summer in Europe. So he searches for a pair on the website of an online retailer. Months later: Tom lands a job in a new city and needs to find a new bank. So he searches for one and reads online reviews to make the best possible choice. Years later: He plans an adventure across the United States. He searches for the right vehicle, not by visiting a dealership’s showroom, but by comparing options on an automotive reviews and resource website like Edmunds or Cars.com. No matter where Tom is in life, he is likely to utilize the Internet, search engines, and digital channels as the first step to finding the services and products he needs. So goes for everyone else. The customer experience has truly gone digital. 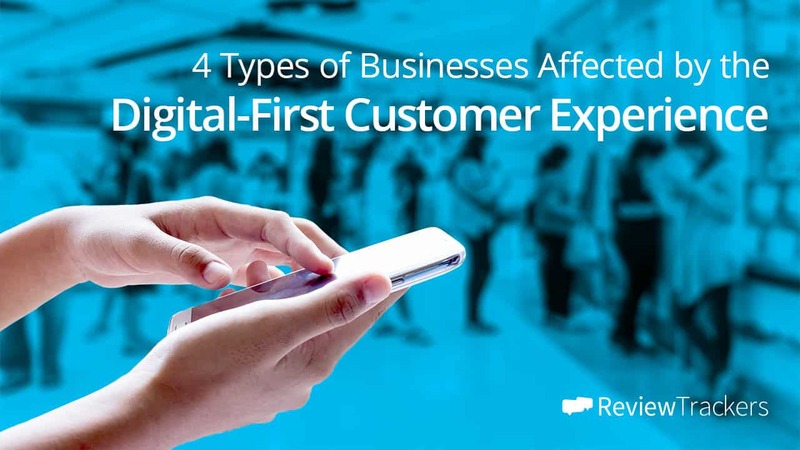 That’s why it’s so important for businesses across a wide range of industries to manage their online brand presence and respond to the challenge of delivering strong digital customer experiences. Winners and losers will be determined by their ability to be found online, build a strong online reputation, drive engagement across search and social, improve conversion, and manage online reviews and customer feedback. There’s already a massive amount of customer data available on social media and online review sites. Banks and financial services providers must harness this data in order to gain insights into the customer experience. Those who ignore it will be left behind. Beyond simply offering an amazing rewards program, extensive investment options, and transactional convenience, companies must also pay attention to things like customers’ mobile experience, online service and support, and brand reputation on social media and online review sites. “Services that invest strategically in the customer experience can not only recapture that investment, but also increase profits and raise customer satisfaction,” according to a study by J.D. Power. In banking and finance, it’s also nearly impossible to build meaningful trust-based customer relationships without investing in digital. Healthcare consumers no longer rely on offline word of mouth or printed yellow pages to find a doctor and receive care. The patient experience has gone digital, too. Online reviews heavily influence patients’ decisions when choosing a hospital or healthcare provider. According to research, 62 percent of survey respondents said they turn to online reviews when choosing a new doctor. And 8 in 10 admitted that reviews influenced their willingness to be treated. Unfortunately, only 5 percent of providers identify as digital-first organizations. 43 percent admit to lacking digital marketing capability because of an unsuitable organizational structure. If Retail’s Digital Summit taught us anything about the customer experience, it’s that the way a customer interacts with a company (especially online) is always changing. This is why in-store experiences are being recreated online, on retailers’ websites, social media profiles, and mobile apps. It’s not enough to have a website that features your products and pricing information. Retailers’ customer experience strategies must become more holistic, taking into account things like user experience, search rankings and search engine optimization, product reviews and ratings, e-commerce features, online service and support, returns and delivery best practices, and social media content. Customers spend an average of 14 hours conducting research online, according to a 2014 study by J.D. Power. Meanwhile, according to AutoTrader.com, 75 percent of the time that consumers devote to buying a car is spent online. The customer experience is an important part of the automotive shopping process. Only, the process no longer takes place exclusively in fancy showrooms at a dealership near you. There are various factors that go into buying a car (loan costs, maintenance, insurance and safety), and before car shoppers ever set foot in a dealership, they will have conducted online research into all these different factors. In a competitive marketplace that sees shoppers using the Internet as an important research tool to guide their decisions, as well as a platform for sharing customer experience and feedback, it makes sense for automotive services and dealerships to tune in and stay engaged. In today’s information-intensive climate, the auto sector must also continue to use data to better understand the needs, desires, and journeys of their customers.